The first excavation of the stones at Stonehenge in Wiltshire for 40 years is under way. The two-week project will focus on the smaller bluestones that make up part of the world-famous prehistoric monument. It aims to date more precisely the double bluestone circle, the first stone structure built on the site. Dr Simon Thurley, chief executive of English Heritage, said: "The bluestones hold the key to understanding the purpose and meaning of Stonehenge." Two metal detector enthusiasts are helping to rewrite history after their latest find in a field near Lincoln. Geoffrey Rippon and Paul Virr literally struck gold while carrying out routine searches in a field near their village of Saxilby. They discovered four pre-Christian gold coins and a gold pellet which are now being counted as evidence of Roman influence on British culture much earlier than previously thought. The hoard, found in October last year, has been dated to 50BC - almost 100 years prior to the date of the official Roman invasion of 43AD. Shakespeare's "lost" local church in London may have been found – beneath some flower beds and cracked paving stones. New research has pinpointed the site of the old church of St Leonard, which was the centre of worship and burial for many of the leading actors and personalities of the Shakespearean stage, including the Bard himself. A study of archive material has revealed that much of the building may still exist, buried underground in an extraordinary time capsule. The long-lost church has been identified in the heart of Shoreditch, the east London district that has more recently become the haunt of late-night clubbers and Brit artists. The old church was demolished in the 18th century and traces of it erased. A new St Leonard's was later constructed in the area, but it has now been established that it was built some distance away from its former home. Francesco d'Errico, an archaeologist from the University of Bordeaux, France, has found crafted lumps of pigment – essentially crayons – left behind by Neanderthals across Europe. He says that Neanderthals, who most likely had pale skin, used these dark pigments to mark their own as well as animal skins. And, since body art is a form of communication, this implies that the Neanderthals could speak, d'Errico says. Working with Marie Soressi of the Max Planck Institute for Evolutionary Anthropology in Leipzig, Germany, d'Errico has recovered hundreds of blocks of black manganese pigment from two neighbouring sites at Pech de l'Azé in France, which were occupied by Neanderthals. These add to evidence of pigment among Neanderthal from some 39 other sites. The finds provide further evidence for the great antiquity of human occupation on the continent, the researchers write in the journal Nature. One of the most important archaeological finds for decades has been uncovered during a sewer improvement project in Poulton. The remains of a Roman roundhouse, thought to date back to the second century, have been discovered on grazing land close to the town. The find was made by workers from United Utilities who were involved in preliminary excavations at the start of a £10 million sewer improvement scheme for the area. As is common when a major excavation starts, an archaeologist was present in case any important finds were made. Within a couple of hours of work beginning on the land off Garstang Road East, Poulton, it was obvious a significant discovery had been made. Carlisle Coroners’ Court heard that a silver Viking jug handle discovered at Beckfoot could be over 2,000 years old. ORGANISERS of The Golden Age of Northumbria project have chosen today - St Cuthbert's Day - to launch an ambitious year-long festival celebrating Northumberland's Anglo-Saxon and early Christian heritage. The initiative has been made possible thanks to a £49,600 grant from the Heritage Lottery Fund. Since the reporting of the so-called “hobbit” fossil from the island of Flores in Indonesia, debate has raged as to whether these remains are of modern humans (Homo sapiens), reduced, for some reason, in stature, or whether they represent a new species, Homo floresiensis. Reporting in this week’s PLoS ONE in a study funded by the National Geographic Society Mission Programs, Lee Berger and colleagues from the University of the Witwatersrand, Rutgers University and Duke University, describe the fossils of small-bodied humans from the Micronesian island of Palau. These people inhabited the island between 1400 and 3000 years ago and share some – although not all – features with the H. floresiensis specimens. Palau is situated in the Western Caroline Islands and consists of a main island of Babeldaob, with hundreds of smaller rock islands to the south west, colloquially known as the ‘‘rock islands.” These rock islands contain caves and rock shelters, in many of which, fossilized and subfossilized human remains have been found. More bones of unusually small-bodied people who lived long ago have been found on another Pacific island, and some scientists say this calls into question claims that the first such specimens, from Indonesia, represent a separate human species. In a report released Monday, Lee Berger, a paleoanthropologist at the University of the Witwatersrand in Johannesburg, described finding the skulls and bones of at least 25 individuals in two caves in Palau, in the Western Caroline Islands of Micronesia. The people apparently lived there 1,400 to 3,000 years ago. Palau is more than 1,000 miles north of the Indonesian island of Flores, where in 2003 scientists discovered bones of several individuals who were only a little more than three feet tall and one surviving skull indicating a brain the size of a chimpanzee’s. Along an isolated, rocky stretch of Greek shoreline, a Florida State University researcher and his students are unlocking the secrets of a partially submerged, “lost” harbor town believed to have been built by the ancient Mycenaeans nearly 3,500 years ago. Pullen and a colleague, Assistant Professor of Classical Studies Thomas F. Tartaron of the University of Pennsylvania, led students from both universities in conducting an initial study of the site during May and June of 2007. What they found was unique: an archaeological site that required very little digging. WORKMEN digging below Bridgwater's Castle Street stumbled across an "outstanding" piece of the town's medieval history last week, unseen for more than 700 years. Wessex Water officials were renovating sewers underneath the street on Monday when they unearthed a smugglers tunnel and part of old curtain wall from Bridgwater Castle - leading one archaeologist to proclaim it "one of the most important finds of the 21st Century". Bridgwater Castle dates back to 1200, where William Briwere built a complex of buildings covering eight acres across parts of present day Kings Square and Castle Street. The giant structure massed next to the river and included a chapel, a kitchen, a cellar, stables and a dungeon. Athens, Greece (AHN) - Brain surgery was performed nearly 1,800 years ago in Greece, archaeologists said Tuesday after they unearthed the skeleton of a young woman from the 3rd Century CE. The skeleton has a large hole on the front of the skull, above the eyes, which the archaeologists believed was caused by an apparently failed brain surgery. The archaeologists added that the young woman died during or shortly after the operation. Though references to brain surgery have been found in ancient writings, this is the first evidence of an actual patient. The woman's skeleton was found during a rescue dig last year in Veria, a town some 46 miles west of Thessaloniki. ATHENS, Greece - Greek workers discovered around 1,000 graves, some filled with ancient treasures, while excavating for a subway system in the historic city of Thessaloniki, the state archaeological authority said Monday. Some of the graves, which dated from the first century B.C. to the 5th century A.D., contained jewelry, coins and various pieces of art, the Greek archaeological service said in a statement. Thessaloniki was founded around 315 B.C. and flourished during the Roman and Byzantine eras. Today it is the Mediterranean country's second largest city. Most of the graves — 886 — were just east of the city center in what was the eastern cemetery during Roman and Byzantine times. Those graves ranged from traces of wooden coffins left in simple holes in the ground, to marble enclosures in five-room family mausoleums. Jonathan Jones is absolutely right to bemoan the tragedy dealt to Stonehenge. The government's rejection of the visionary landscape scheme, which had taken so long to design at such cost, was crass, short-sighted and unforgivable - and will haunt future generations. But his explanation for what happened is wrong (The final insult, March 5). Stonehenge, he says, "is part of a 'sacred landscape', still visible on Salisbury Plain ... at least, that's the theory currently championed by leading archaeologists, including Mike Pitts and Francis Pryor, both of whom have written lively books on the subject. But I think this very theory is to blame for what is happening at Stonehenge." This expansive view, suggests Jones, pitted the National Trust (which owns the landscape) against English Heritage (which owns the stones), contributing "to the disagreements that have led to this impasse". The National Trust's recent objections to the proposed road tunnel (they were once allies of English Heritage) have been unfortunate, but have little to do with archaeology. Neither did the protests from others stem from our growing realisation that, more than 4,000 years ago, the stones were part of a yet grander religious and social scene. Indeed this knowledge was responsible for some of the more imaginative aspects of the now abandoned scheme. British and Dutch archaeologists will together investigate the Stone Age landscape under what is now the North Sea after newly dredged axeheads showed humans lived there alongside mammoths 100,000 years ago. With sea levels lower then and more of the world's water locked in ice caps, the land between modern Britain and Holland resembled a Siberian tundra grassland where experts already knew large mammals such as sabre-toothed tigers once roamed. But they say a haul of 28 flint hand-axes dredged from the seabed some eight miles off Great Yarmouth and unloaded at a Dutch wharf allow them firmly to place humans alongside the Ice Age animals for the first time. "Up until now, it has been believed that the northwest European peninsula was devoid of human activity at that time," said Mark Dunkley, an archaeologist with English Heritage. Almost €30m has been spent so far on archaeology for the controversial M3 motorway near Tara where protesters have tunnelled in to hold up work. This is one-tenth of the entire €300m earmarked for archaeology costs on the entire national motorway programme, the Irish Independent has learned. The war of words continued yesterday between protesters, who have occupied tunnels they secretly made beside the Rath Lugh protected monument, and the National Roads Authority. The Save Tara campaign group said yesterday that a young woman has vowed to seal herself into one of the tunnels to protect the hill, which is studded with ancient earthworks. A sixth-century copper factory, medieval kitchens still stocked with pots and pans, and remains of Renaissance palaces are among the finds unveiled by archaeologists digging up Rome in preparation for a new subway line. Over the last nine months, remains—including Roman taverns and 16th-century palace foundations—have turned up at the central Piazza Venezia and near the ancient Forum, where works are paving the way for one of the 30 stations of Rome's third subway line. The discovery of the remains of a Roman villa in Cambridgeshire has left archaeologists "blown away". The villa, hidden deep in more than a square mile of ancient woodland at Bedford Purlieus, near Peterborough, had gone unnoticed over the centuries. Experts believe the remains at the site, just off the A47 at Wansford, probably date back to between the second and fourth centuries AD. It was identified almost 200 years ago by local explorer Edmund Artiss. An amazing haul of 28 flint hand-axes, dated by archaeologists to be around 100,000 years-old, have been unearthed in gravel from a licensed marine aggregate dredging area 13km off Great Yarmouth. The find was made by a Dutch amateur archaeologist, Jan Meulmeester, who regularly searches for mammoth bones and fossils in marine sand and gravel delivered by British construction materials supplier Hanson to a Dutch wharf at Flushing, south west Netherlands. 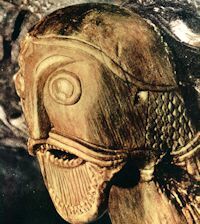 The axes show that deep in the Ice Age, mammoth hunters roamed across land that is now submerged beneath the sea. These are the finest hand-axes that experts are certain come from English waters, although there have been several finds on beaches, for example at Pakefield in Suffolk. PUB landlord Billy Nettleton was astonished after a 700-year-old grave cover was discovered in his village pub - thanks to the smoking ban. He knew nothing about the carved stone relic that had been built into an internal passage wall. But one of his regulars, archaeologist Percival Turnbull, spotted it low in the wall as he stood outside puffing his pipe, because he can no longer smoke in the bar of the Blacksmiths Arms in Mickleton, County Durham. Axes from the Ice Age used by mammoth hunters when the North Sea was dry have been found from under the water off the Norfolk coast. Dutch amateur archaeologist Jan Meulmeester found the 100,000-year-old hand axes in gravel dredged from eight miles (13km) off Great Yarmouth. Bones and teeth were also found along with the 28 axes. Man used to roam the area now covered by the North Sea using flint tools to butcher animals such as mammoths. Stunning mosaics are gracing the floors of a popular museum. Fishbourne Roman Palace, near Chichester, is playing host to an exhibition of Italian mosaics – featuring mosaics as old as the 4th century BC. The exhibition has been produced by the municipality of Ravenna in Italy as a good-will gesture to celebrate the twinning of Chichester and Ravenna. The mosaics range from a simple pebble mosaic of a seahorse from Mozia, dating from the 4th century BC, to a stunning fragment of mosaic floor from Aquilia, made from tiny stones. QUARRYING of land close to an ancient site near Ripon has been halted following a legal challenge in the High Court. It is the latest twist in a long running saga over proposals by Tarmac Northern Ltd to quarry 1.1 million tonnes of sand and gravel near the Thornborough Henges, described by archaeologists as 'the Stonehenge of the North'. After a series of objections and a revised application, North Yorkshire County Council granted permission more than a year ago for an extension of quarrying operations covering 76 acres of land at Ladybridge Farm, Nosterfield. The weapons of the stone age Norfolk men who hunted mammoths on what is now the bed of the North Sea, and fragments of the beasts they slaughtered, have turned up in Holland, spotted by an amateur archaeologist in a load of gravel. The 28 finely worked hand axes are believed to be more than 100,000 years old - possibly far older - and were described yesterday by archaeologist Phil Harding as "the single most important find of ice age material from below the North Sea". Some of the world's best preserved prehistoric landscapes survive in pristine condition at the bottom of the North Sea, archaeologists claimed yesterday. Dating from at least 50,000-60,000 years ago, they were found with other flint artefacts, a large number of mammoth bones, teeth and tusk fragments, and pieces of deer antler. The sea bed location was probably a Neanderthal hunters' kill site or temporary camp site. About 3,000 skeletons are to be reburied in an Anglo-Saxon ceremony at a North Lincolnshire church where they were discovered almost 30 years ago. The ancient language will be used by the Reverend David Rowett at St Peters Church in Barton-upon-Humber to mark the return of the historic bones. Unearthed between 1978 and 1984, the bones have been used by English Heritage to research diseases. Archaeologists unearthed a medieval belt buckle in Perth following work to repair a collapsed sewer. The group were allowed to examine the area in the Kirkgate as Scottish Water repaired the network. The copper alloy buckle is believed to date back to the 12th Century and was found along with animal bones, shells and pottery. Archaeologists have found what they describe as a remarkable Iron Age waterhole on the site of an extension to York University. The waterhole complete with a preserved wickerwork lining was revealed during excavations in Heslington village. The structure also contains fragments of wood giving clues to the landscape of the time, about 2,500 years ago. 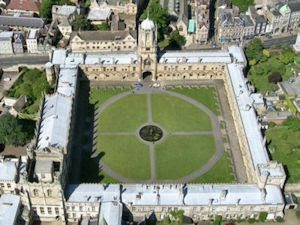 The university's archaeology department plans more digs at the site, which also contains an important Roman building. Research work regarding a large 11,000-year-old ceremonial center at Gobekli Tepe ("navel hill") in Turkey by archaeologists has suggested that it was the need for communal rituals that led to the rise of civilization. Gobekli Tepe is situated on the most prominent hilltop for miles around. It consists of at least 20 underground rooms that contain a number of T-shaped stone pillars that are 8 feet tall and weigh about 7 tons. The pillars are engraved with images of animals, including leopards, snakes and spiders. According to German archaeologist Klaus Schmidt, “This is not a place where people lived. It's as far away from water as you can get in this region. Instead, it's a place of ceremony. CITY MP Stewart Jackson has urged the Government to cough up money to help a cash-strapped archaeological site near Peterborough. Flag Fen to the east of the city, is described by Mr Jackson as "one of Western Europe's finest Bronze Age sites". But the attraction – which needs about £300,000 a year to cover its bills – receives no funding from Whitehall. Mr Jackson has tabled a Parliamentary question to ask if the Government plans to dip into its coffers to support the expansion of the exhibition at the site and further excavations to unearth more of its secrets. STONEHENGE was the site of Stone Age battles to the death, an archaeologist has claimed. Dennis Price, a Stonehenge expert and former archaeologist with Wessex Archaeology, says he thinks a skeleton discovered in a ditch around the ancient monument in 1978 is evidence that the site was used for ritual combat. The skeleton belonged to a man who had been killed by arrows in 2,300 BC and after being analysed was donated to Salisbury Museum. Exquisitely preserved frescoed rooms in the ruined house of Augustus, the first Emperor of Rome, open to the public tomorrow for the first time since they were unearthed nearly half a century ago. Archaeologists say that the future emperor lived in the house on the Palatine Hill above the Forum in about 30BC, before he gained supreme power and built his imperial palace complex higher up the hill. The paintings have been restored at a cost of nearly €2 million (£1.5 million). The wall and ceiling paintings in the house - discovered in the 1960s by the Italian archeologist, Gianfilippo Carrettoni - are in vivid red, blue and ochre. They include a small study, believed to have been Augustus's private retreat. Originally called Octavian, Augustus was the great-nephew and adopted son of Julius Caesar, and took the name Augustus on becoming sole ruler in 27BC after the civil wars that followed Caesar's assassination. His rise ended the Roman Republic and marked the beginning of the Roman Empire. He died in 14AD. WANT 'A DIG' IN YOUR GARDEN? People in Mansfield Woodhouse are being asked to help trace the remnants of the medieval village which burnt to the ground in 1304. Last autumn, residents let a team of council community archaeologists excavate small areas of their land, to determine the size and location of the 14th Century village. Now the team is calling for further help to help build a picture of how the settlement may have moved and changed from the medieval period to today. Council archaeologist Alistair Bush said: "We want people to be a part of their local history. EIGHT Anglo-Saxon grave markers belonging to ordinary folk have been uncovered in Peterborough Cathedral's grounds during restoration work. Workers at the site, who are repairing ancient stone walls in the precincts, alerted the cathedral's archaeologist to the find, which was discovered in the same wall as a medieval fireplace. Archaeologist Dr Jackie Hall analysed the pieces, and discovered they were 11th century grave markings which are believed to have come from a monks' cemetery. Dr Hall said: "It was an incredible find, and very exciting to see such a large collection of grave markers in one small area. They are particularly important because we don't have anything else like this in Peterborough. There are other grave markers of a similar date in the cathedral, but they are ornate and not visible to the public. Although these pieces are not as high class or as special, they are still an extraordinary find." The markings could have belonged to monks, but are more likely to have belonged townsfolk who wanted to be commemorated at the abbey. Although some were not immediately recognised as they have been damaged, some can be seen with crosses on them and others are slightly more ornate with gridded markers. Cavo Sidero: is this Crete's paradise lost? Having worked on the island of Crete for more than 45 years as an archaeologist and with a strong interest in Cretan botany, I consider the proposed tourist complex at Cavo Sidero on the north-eastern promontory of the island to be a complete environmental disgrace (UK firms plan vast resort on fragile coast; Harsh course of nature, March 5). The complex will impact severely on an unspoilt landscape of wild natural beauty, high botanical interest and full of ancient sites. There will also be a huge demand for non-existent water, met only by major desalination, which itself has energy costs. It is a sparsely populated area, so the proposal will have minimal local employment gain (and would all employees actually be local people?). And what is all this large environmental cost and irrecoverable damage for? Straight financial gain. Anyone with a love of Crete and its environment should strongly oppose this scheme. ARCHAEOLOGISTS have uncovered what they believe to be part of a large medieval village and the remains of a castle at separate sites in north Cork. The village could date back as far as the 12th century, and has yielded corn-drying kilns, pottery and iron artefacts, including weapons. Archaeologists have only barely scraped the surface. The find was made as Cork County Council workers were undertaking road improvements between Twopothouse and Doneraile. The skeleton, that of a man who had been killed by arrows in 2,300 BC, was discovered in the ditch surrounding the stones during excavation work, carried out by Professor Richard Atkinson and J.G Evans in 1978. After being analysed, the skeleton was donated to Salisbury museum, where it has been on display as a key part of the museum's Stonehenge exhibit under the title of "the body from the ditch". However, Stonehenge expert and former archaeologist with Wessex Archaeology, Dennis Price, believes the skeleton's inauspicious title belies the fact the remains offer tangible proof the site was once used as an ancient arena hosting violent combat sports. The winter light is kind to the stones. Its mild greyness reveals the beauty of the blue lichen that has grown for thousands of years over their surfaces and even, from the right point on the path, lets you see the sinister shape of a bronze-age dagger carved into bleak rock. I'd love to be able to say it's an encounter that leads me far from the modern world into eerie reveries - but that would be a lie. In the misty, rainy morning, pairs of bright white lights keep appearing on the near horizon, and across the grass there is the unholy spectacle of a continuous flow of cars and trucks on the A303. Amazingly, this crowded road is soon going to get worse. In February, it was revealed that Tesco plans to build a gigantic warehouse near Andover, from which it is estimated a Tesco juggernaut will emerge every minute - many of them on to the A303. Road construction on the western Greek island of Lefkada has uncovered and partially destroyed an important tomb with artifacts dating back more than 3,000 years, officials said on Wednesday. The discovery could fuel debate on a major prehistoric puzzle - where the homeland of Homer's legendary hero Odysseus was located. "This is a very important find for the area, because until now we had next to no evidence on Mycenaean presence on Lefkada," excavator Maria Stavropoulou-Gatsi told The Associated Press. Stavropoulou-Gatsi said the tomb was unearthed about a month ago by a bulldozer, during road construction work. THE remains of an ancient Roman shopping parade, hidden for centuries under the floorboards of Cirencester's historic Corn Hall have been unearthed this week. Workers came across the remains of what archaeologists claim is the most significant Roman discovery in the town in the last 50 years while carrying out refurbishment work. A series of walls were discovered 10 feet below the level of the floorboards in the main room of the 19th Century building along with evidence the site used to house shops over 2,000 years ago. And alongside the remains evidence of Ermine Street, the famous Roman road which ran from Silchester to Gloucester. The finds are so recent that experts at the Demokritos Center have not yet completed the analysis of bones that will yield precise dates. However, the initial evidence supplements what is already known about Pella in the Early Bronze Age (2100-2000 BC), when it was the most important city in Bottiaea, long before it was made capital of the Macedonian realm. What became known as “the greatest of Macedonian cities” was apparently built on top of the prehistoric graveyard when Archelaus moved his capital there from Aiges, excavation director Professor Ioannis Akamatis told Kathimerini. Anthropologists have fired another salvo in a feud about diminutive "hobbit" people whose fossilised remains were found in a cave on a remote Indonesian island four years ago. Combatting a bid to have the hobbits enshrined as a separate branch of the human family tree, they argue the tiny cave-dwellers were simply Homo sapiens who became stunted and retarded as a result of iodine deficiency in pregnancy. Dubbed after the wee folk in J.R.R. Tolkien's tale, the hominids -- just a metre (3.25 feet) tall and with a chimp-sized brain -- lived around 18,000 years ago on the island of Flores. The Australian-Indonesian team which announced the discovery in 2004 honoured the cave-dwellers with the name of "Homo floresiensis," or "Man of Flores," to bolster their claim that the hobbits were a new species of human. Is a remote peninsula with great archaeological and environmental importance really a suitable site for a golf course and resort? Crete is not just an island of crowded holiday resorts. Even on the coast, it still has its remote, wild, rocky places - such as the extreme north-east tip, a jagged 26 sq km peninsula of lonely, vulture-haunted crags, grey-green bushes and white limestone desert, far from the tourist crowds. In this unlikely place, known as the Toplou peninsula, Minoan Group, through its subsidiary Loyalward, wants to build a luxury resort made up of golf courses, holiday villages and hotels on land leased from a venerable but declining monastery. The sport of golf has moved far from its ancient beginnings among Scotland's sand dunes. It was transformed by Americans, who industrialised it and watered and bulldozed, exporting it to unsuitable parts of the world. Modern golf in the wrong places can do lasting environmental and social damage. Golf courses now try to keep green all through the year - even during the rainless summers of Mediterranean countries - and use immense quantities of water and polluting chemicals. The Cavo Sidero development, as it will be known, seems particularly unsuited to the area. Anyone who has experienced the merciless winds will be sceptical about playing golf there at all. At present, this remote place has no infrastructure: no buildings, water or electricity, and providing any would do great damage to the ecology. There is no local population, workers will have to be brought in from elsewhere. This article proposes a multi-technique GIS (Geographical Information System) approach to visibility analysis intended to address some of the shortcomings of the traditional binary viewshed. Its ultimate aim is to obtain more accurate viewsheds and, thus, gain more robust archaeological conclusions from their analysis and interpretation. Oldest primate fossils in America suggest they came straight from Asia. Several teeth of mouse-sized primitive primates have been unearthed in Mississippi that are older than any other such fossils found in Europe or North America. The record-breaking tiny chompers suggest that the creatures travelled from Asia to North America across the Bering land bridge between Siberia and Alaska, and then later journeyed on to Europe across another land bridge linking North America to Greenland and Scotland. In the hot and humid heyday of the Palaeocene–Eocene Thermal Maximum, which occurred about 55 million years ago, both of these land bridges are thought to have been muggy, forested places. "Think about Costa Rica in Alaska," says study author Christopher Beard, a palaeontologist at the Carnegie Museum of Natural History in Pittsburgh, Pennsylvania. Scientists keep finding more similarities between humans and chimps. They share most of our genes, they seem to be able to handle tools, and they grasp some English pretty well, too. Now researchers have found that we share a similar brain pattern when communicating. Broca's area, located in the part of the human brain known as the inferior frontal gyrus, has been shown to be critical for human speech and sign language. When a person speaks, or even plans to say something, this region lights up with activity. "This is the first time someone has measured activity in that area in chimp brains," said Jared Taglialatela, a biologist at the Yerkes National Primate Research Center in Atlanta. "It looks like a similarity between humans and chimps." A pioneering study of life recorded in giant sinkholes that extend far below sea level has shown scientists the catastrophic impact that ancient communities had on their environments. By swimming down into "blue holes" - vertical caves in the landscape - scientists can travel back in time, exploring a treasure trove of fossils and gaining a new understanding of the prehistoric ecosystem. The holes are so named because of the dramatic contrast between the dark blue saltwater of their depths and the lighter blue of the freshwater shallows around them. The holes, such as the Great Blue Hole at Lighthouse Reef Atoll, Belize, can sink to depths of more than 650ft and are typically found in the Caribbean on the Bahama Banks, as well as on and around the Yucatán Peninsula. Seamus Heaney claimed this weekend that the ancient Hill of Tara was safer under British rule than the present Irish government, describing the construction of a motorway near the site as a betrayal of 'Ireland's dead generations'. The Nobel laureate's attack on the construction of the €800m road linking Dublin with Counties Meath and Cavan is compounded by sharp criticism from the World Monuments Fund. The New York-based organisation has compared the building of the motorway through the Tara Skreen valley to the Taliban's deliberate destruction of the giant Bamiyan Buddhas in Afghanistan in 2001. The assaults on the Tara motorway project are broadcast in a documentary this weekend on BBC Radio Ulster. The Irish government has insisted the road is a vital piece of infrastructure to ease severe traffic congestion suffered by commuters in the satellite towns on the north and west of Dublin. Conservationists and historians from all over the world furiously oppose the project, which they say will desecrate the ancient seat of the High Kings of Ireland - and a place of Celtic mythological legend. One of the Isle of Wight's most important historical sites is set to be uncovered in a five-year long archaeological dig. Only part of Brading Roman Villa has been excavated so far. Now a leading Oxford University professor and 20 graduate archaeologists are to work on the four-acre site to excavate it further. Sir Barry Cunliffe said there are signs the north side could contain a large assembly hall with side aisles. He is hoping to find more mosaic floors like the ones in the main building. MEMBERS OF the Iron Age team at the Scottish Crannog Centre at Kenmore, Loch Tay have set out on a voyage of discovery to the Lofoten Islands off Norway. The group will be participating in a living history conference at the Lofotr Viking Museum at Borg. The trip is the third of eight learning journeys for the crannog crew involving archaeological open-air museums in Germany, Hungary, Italy, Latvia, the Netherlands, Norway and Sweden in addition to Scotland as part of a European cultural exchange project called liveARCH. This latest visit will involve seminars on living history, interpretation, marketing for open-air museums, and training. German treasure hunters have stopped digging for Russia's lost Amber room and Nazi gold after a disagreement. One of the men, the local mayor, claims scientists should become involved in the excavation to make it more credible. The other says his own measurements are precise enough, but haven't been followed properly. Severe cutbacks in researchers' freedom to study bones and skeletons from ancient graves have been imposed without warning by the Ministry of Justice. The move has caused consternation among archaeologists, who say that the restrictions will badly damage their ability to study Britain's past. The ruling means permission for digs at burial grounds and old churchyards will be denied in some cases, while in others excavated human remains will have to be reburied within two months of their discovery. In the past, researchers have been allowed to analyse skulls and bones for long periods. At the Vineyard, Abingdon, in Oxfordshire, for example, archaeologists uncovered hundreds of bodies from Roman, medieval and Civil War graves in the Nineties and then stored them before using them as sources for the first DNA sampling of buried human remains. The regular series of Time Team delights lovers of history with every episode, but occasionally something so marvellous comes to light it requires a spin-off programme. The Real Knights of the Round Table: A Time Team Special is just such a show, and will have devoted fans jumping for joy. In 2006, the team undertook one of their most ambitious live projects ever - a series of digs at three royal palaces, Windsor Castle, Buckingham Palace and Holyrood Palace. The event was timed to coincide with the Queen's 80th birthday celebrations, but no one could have guessed what fabulous gifts were waiting to be discovered. At Windsor, the oldest inhabited royal residence in the world, the experts went in search of a fabled lost building - Edward III's Round Table. "ESMAIL JORJANI WAS an influential Persian physician and anatomist of the 12th century who did most of his writing after his seventh decade of life (see also Anatomy). Jorjani's comprehensive textbook of medicine, Zakhirey-e Khwarazmshahi (The Treasure of the Khwarazm Shah) was written in approximately AD 1112 and is considered to be the oldest medical encyclopedia written in Persian," investigators in the United States report. "This was an essential textbook for those studying medicine during this time. We describe the life and times of Jorjani and provide a translation and interpretations of his detailed descriptions of the cranial nerves, which were written almost a millennium ago. Medieval Persian and Muslim scholars have contributed to our current knowledge of the cranial nerves," wrote M.M. Shoja and colleagues, University of Alabama. The archeologist Hermann Parzinger has taken up the position of head of the Foundation of Prussian Cultural Heritage, the largest and one of the most significant cultural organizations in Europe. Established in 1957, the foundation has 2,000 staff members, a budget of more than 250 million euros ($376.2 million), 17 museums, and well as libraries and research institutes. It includes renowned museums such as the Pergamon Museum, with its vast collection of Classical and Middle Eastern antiquities, and the New National Gallery, which specializes in modern European and American art. Born in Munich is 1959, Parzinger was previously the head of the German Archaeological Institute, which he expanded and modernized. In an AP interview, Parzinger admitted it would be difficult to have less time to dedicate to his passion of archeology, but described his new task as "amazing" and said he was "greatly looking forward to it." An excavation is about to start at one of the most important Roman villas in Western Europe. Its spectacular mosaics were saved by readers of The Times five years ago after being placed on the World Monuments Fund’s list of the most endangered sites. One of Britain’s leading archaeologists is to explore the 1.6hectare (4acre) site around Brading Roman Villa on the Isle of Wight. Barely 15 per cent of it has been excavated and the dig is expected to last five years. Sir Barry Cunliffe, Emeritus Professor of European Archaeology at Oxford University, said that the north side appeared to suggest a large assembly hall with side aisles. The finds could include mosaics, although it is unlikely that they would match the quality of those within the villa itself with their depictions of peacocks signifying eternal life, Orpheus charming the beasts of the forest and Tritons, or sea deities, carrying reclining nymphs on their backs. Experts have digitally rebuilt the face of 18th century German composer Johann Sebastian Bach -- and say the results may surprise his fans. Using his bones and computer modeling, they have come up with an image of a thick-set man with closely-shorn white hair. The new Bach face, the creation of Scottish forensic anthropologist Caroline Wilkinson, will go on display at the Bachhaus museum in the eastern German town of Eisenach, Bach's birthplace, next month. Eighteenth century portraits show him very differently. "For most people, Bach is an old man in a wig, it is a stylized image, we have no realistic portrait of him," Joerg Hansen, managing director of the museum, told Reuters.